The Hewn Log Workshop is limited to 12 participants. Learn the skills and techniques needed to build a hewn log cabin from scratch. Practice how to hew logs with axe, adze and broadaxe; mark and cut dovetail corner notches; peel bark with drawknives; move logs with peavey and timber carriers; and raise logs. 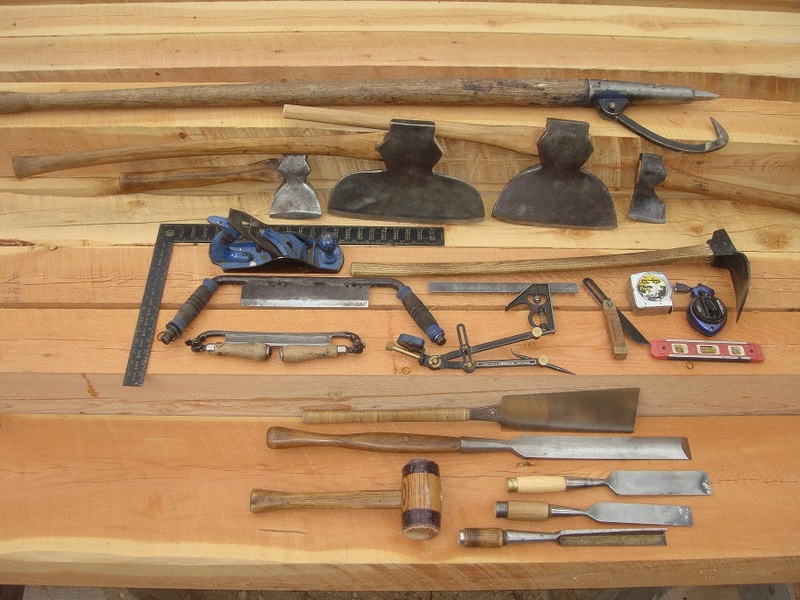 Shingle splitting, chinking, tool-sharpening and other styles of log notching will be demonstrated. Students will attempt to complete all aspects of log cabin building in this week. This class will be oriented towards traditional log building skills (as opposed to professional, production style classes). People interested in building their own log hewn house, or in historical preservation of dovetail cabins will find it particularly useful. Emphasis will be placed on demonstrating and using traditional hand tools and techniques, although more modern tools will be used as needed. The photos below show many of the tools that will be used in this workshop.